While Tahoe’s alpine playground is still just as tempting during the early autumn, it is this time of the year that Tahoe’s offerings give your tastebuds a reason to rejoice. North Lake Tahoe also has been known to have some of the best food and brews in the Sierras. The delicious gastronomical offerings across the North Shore are matched only by the uniqueness of the venues in which they can be found. With events like the North Lake Tahoe Autumn Food & Wine Festival, Oktoberfest, and a host of bars and restaurants dotting the North Shore, the adventure is just beginning when you’re headed off the trail for a bite. The Village at Squaw Valley is transformed into a miniature Bavaria for Oktoberfest, complete with authentic German beer and food, Bavarian music, the ever-popular Oktoberfest Games and plenty of family fun. Entrance is free and all proceeds from beer sales benefit the High Sierra Lacrosse Foundation. Festival goers must be 21 years or older. Saturday, Sept. 24, 2016 @ 2 p.m. to 6 p.m.
Tahoe Donner hosts its 7th Annual Fall Festival on Saturday, Oct. 8 from 11 a.m. to 5 p.m. at the Northwoods Clubhouse. The expansive pumpkin patch and maze are Fall Festival highlights; in addition, festival-goers will enjoy a barbecue, seasonal beer, arts and crafts vendors, and live music and performances by local musical groups. Children’s activities include pony rides, a kids’ carnival area, bounce house, caramel apple decorating, pumpkin carving, face painting and more. Dog owners can even bring their four-legged friends out for the annual doggie dip event at the Northwoods Clubhouse Pool. Homewood Triple Threat Adventure Film Festival is a weekend of outdoor adventure films featuring three nights of rock, dirt and snow. Starting on Friday, Sept. 30 and running through Sunday, Oct. 2, each of the showings take place at Homewood Mountain Resort’s North Lodge on the 27ft outdoor air screen. Tickets grant access to all three nights. Price: $20 in advance; $25 at the door. Time: 6:30 p.m.
At the Ritz-Carlton, Lake Tahoe, everyone can enjoy a weekend of culinary activities, spa treatments, and family fun on Oct. 8 and 9. On Saturday, take a family-friendly Harvest Hike to Sawmill Lake, followed by an Epicurean Dinner – a four-course dinner prepared to showcase a cornucopia of fall harvest. Then, throughout the weekend at The Pumpkin Patch, join families picking out pumpkins, enjoying candy apples, sipping on hot apple cider, and painting pumpkins. Local watering holes are nearly as spread out around North Shore as sandy beaches and aspen groves, so it’s easy to plan a day trip around both when visiting Tahoe during early autumn. North Lake Tahoe has enough seasonal beers to please any beer aficionado. 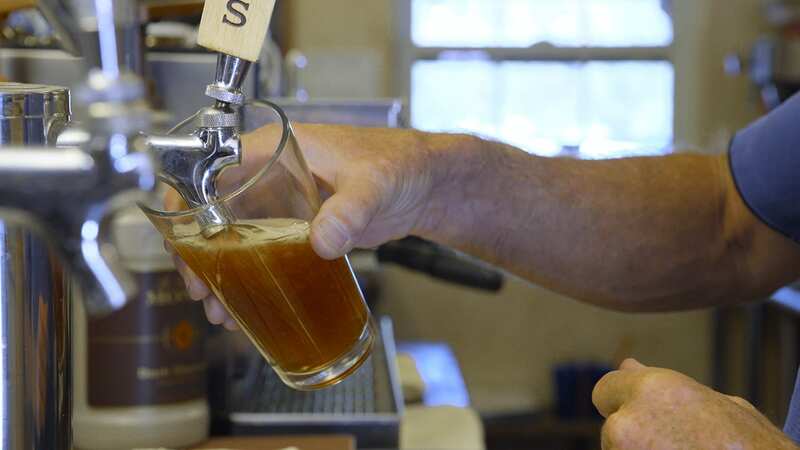 Grab a locally brewed, seasonal ale at Tahoe Mountain Brewing Company, in Tahoe City, or Alibi Ale Works in Incline Village. Try the rotating draft amidst Old Western ambiance at Cutthroat’s Saloon, located in the Hyatt Regency, Lake Tahoe Resort, Spa and Casino in Incline Village. And with more than 40 beers on tap, Mellow Fellow in Crystal Bay is bound to satiate any thirst from a full day of leaf peeping. Chef Douglas Dale’s cookbook and memoir, Wolfdale’s Cuisine Unique will arrive fall 2016. This is his first book since opening Wolfdale’s in March 1978, full of tales and tastes spanning the past 38 years. More than a cookbook, Wolfdale’s Cuisine Unique is an autobiography in which Chef Dale shares stories of culinary passion and creativity. Each chapter begins with a personal account from a different period of his life, followed by signature recipes across Starters, Soups & Salads, Entrees, Sauces, Basics, Desserts, and Spirits. Throughout the book’s 220 pages, stunning photography compliments each of nearly 70 recipes and provides a visual timeline of his years in Buffalo, Boston, studying in Japan, the early days of Wolfdale’s, and it’s current location in Tahoe City, California. In 1978, Chef Dale opened the original Wolfdale’s in Homewood, California on the west shore of Lake Tahoe. The isolation of the tiny mountain community allowed him the creative liberty to invent new recipes instead of being influenced by culinary food fads. In 1986 at the age of 33, Dale and his wife Kathleen moved Wolfdale’s to the larger north shore community of Tahoe City. The historic building was built in 1889 in south Lake Tahoe and was moved 22 miles across the lake aboard a log barge in 1901. With numerous renovations along the way, Wolfdale’s welcomes old friends and new guests 30 years later. Wolfdales is located at 640 N Lake Blvd in Tahoe City. For a full list of restaurants in North Lake Tahoe, visit our Dining Things to Do page. The post Food, Brews & Festivals You Can’t Miss This Fall In North Lake Tahoe appeared first on Go Tahoe North.